There have been significant developments in mobile journalism production over the past year, with many news organisations around the world altering their workflows to adapt to using new mobile technologies. Speaking at MoJoCon in Ireland today, pioneers of mobile journalism discussed their experiences innovating in this area, looking forward to the future of mojo in the newsroom and giving advice to those looking to get started in their own news organisations. Geoffrey Roth, former managing editor of KRIV, the Fox-owned local television station in Houston, Texas, and now owner of mobile journalism training and production company Mojo Navigator, recently built the first ever entirely IP-based local newsroom for FOX at WJZY in Charlotte, North Carolina. All staff at WRZY work as mojo reporters, shooting their own stories on iPhones and small JVC 650 cameras, and editing on iPhones and laptops. "We wanted to have a decentralised newsroom, where we eliminated travelling back and forth between the station and the areas reporters cover – they can just work out of their home," said Roth. "They were able to get the stories that our competitors weren't getting - we weren't just being time-efficient and saving money, we were making a difference editorially as well." Mobile journalism proved useful for Germany's leading news website Spiegel Online during the refugee crisis. The digital publisher was able to send 15 video reporters out to different locations all over Germany and each was able to produce video footage of a professional standard. 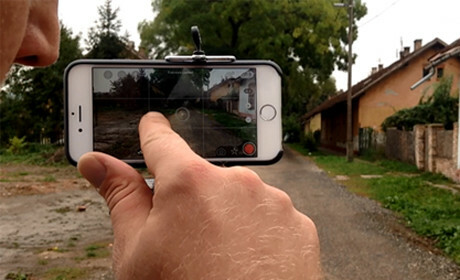 Sandra Sperber, video reporter at Spiegel Online, initiated this video project that was produced solely on smartphones. She said that the success of the coverage was due to "keeping it simple" – some reporters had little experience using mojo tools, but stuck to just one or two apps that they were able to cope with and their work improved as the day went on. "It changed our perception of what mobile journalism can achieve," Sperber added. "We were impressed by how fast we could get all the footage from the field into our newsroom, so we then went on to adapt a similar workflow into our news reports. "Even our video professionals got used to shooting on smartphones, so everyone else can do it too," she said. Viasen Soobramoney, mojo lead at Independent Media South Africa, believes that eventually every reporter will become a mobile journalist, as it enhances their capabilities and skill sets. He said that when he established South Africa’s first mojo newsroom at Independent Media, an organisation that was very print-centric, he was challenged with changing people's mindsets and find out where mojo would fit in the "traditional print beast". "Mojo is something that you need to do – you can go about theorising about it forever. When you start going out there and doing stuff, that is when the real learning happens," said Soobramoney. Having trained approximately 300 journalists across their newsrooms who collectively produced over 2,500 video stories, he said there are five steps that publishers need to take in order to integrate mojo into their organisation. "My advice for news organisations looking to get started would be to think digitally to change mindsets and to adopt a 'show and tell' approach. "Seeing is believing – give reporters the tools to practise, integrate mojo into their workflow – it shouldn't be seen as more work for them. And finally, incentivise it," he said.